I’ve recently been reunited with all my collage material. It is pure joy to haul all the brown envelopes of magazine pics out, dump them all over the table and get busy creating. Collage is a wonderfully creative and therapeutic activity. Give it a try if you are trying to work something out. Whatever comes out of the process is bound to be enlightening. 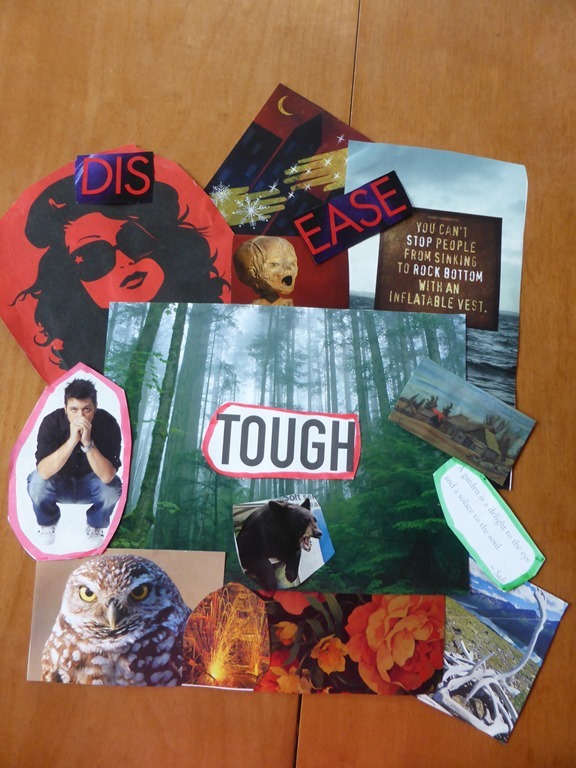 This entry was posted in Art, Life and tagged collage for writers, collaging, therapeutic art activity, working through tough issues, writers tips. ← Special Offer – A Chance to Read Stuart Campbell at a Discount! i love making collage projects too! There is just something so non-threatening about cutting, arranging and pasting. Anyone with art anxiety really needs to try collaging out. The many ways collage can be used in therapy as well as for personal development have literally filled books. I love the poem idea. I’d like to develop this tool in greater detail with particular emphasis on how writers can use collage to stimulate the creative juices, get by roadblocks or further plot lines. Yes, yes, yes 🙂 On top of everything else I’m saying about how useful collaging can be, it is fun. Oh you’re preaching to the converted here. I love it! Enjoy and while away those hours! I can imagine at creative design type like yourself, Jackie, busy with the scissors and paste – arranging and rearranging. It is good work for the soul.